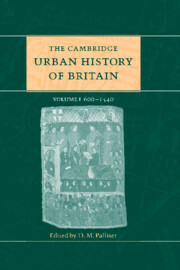 The first volume of The Cambridge Urban History of Britain surveys the history of British towns from their post-Roman origins in the seventh century down to the sixteenth century. It provides the first ever detailed overview of the course of medieval urban development, and draws on archaeological and architectural as well as historical sources. The volume combines thematic analysis with regional and national surveys, with full coverage of developments in England, Scotland and Wales. The international team of contributors represent historical, geographical and archaeological expertise, and the whole marks a major step forward in the understanding of the medieval British town. Part I examines historiographical tradition and the origins of British towns. Parts II and III focus on the early and later medieval periods respectively, and Part IV contains a sequence of systematic regional surveys. Extensively illustrated, the volume also contains ranking lists of towns and an extensive bibliography. Preface, Plates, Maps and figures, Tables, Abbreviations, Acknowledgements, List of contributors, Part I. Introductory: 1. Introduction D. M. Palliser, 2. The origins of British towns D. M. Palliser, Part II. The Early Middle Ages c. 650c. 1300: 3. General survey Grenville Astill, 4. Power and authority James Campbell, 5. Society and population Richard Holt, 6. The economy of British towns Richard Britnell, 7. Churches, education and literacy in towns Julia Barrow, 8. The topography of towns D. M. Palliser, T. R. Slater and E. Patricia Dennison, 9. London from the post-Roman period to 1300 Derek Keene, 10. The large towns to c. 1300 David A. Hinton, 11. Small towns 6501270 John Blair, Part III. The Later Middle Ages c. 1300c. 1540: 12. General survey Barrie Dobson, 13. Government, power and authority S. H. Rigby and E. Ewan, 14. The economy of British towns Richard Britnell, 15. Urban culture and the church Gervase Rosser, 16.The built environment John Schofield and Geoffrey Stell, 17. London Caroline M. Barron, 18. The greater towns Jennifer Kermode, 19. Port towns: England and Wales Maryanne Kowaleski, 20. Small towns 12701540 Christopher Dyer, Part IV. Regional Surveys: 21. Regional introduction (England and Wales) Derek Keene and D. M. Palliser, 22 (a). The south-east of England Derek Keene, 22 (b). The south-west of England T. R. Slater, 22 (c). The Midlands Christopher Dyer, 22 (d). East Anglia Barbel Brodt, 22 (e). Wales and the Marches Ralph Griffiths, 22 (f). Northern towns Jennifer Kermode, 23. Scotland E. Patricia Dennison and G. Grant Simpson, Part V. Conclusion: 24. Conclusion D. M. Palliser, Appendix: ranking lists of English medieval towns Alan Dyer, Select Bibliography, Index.